Good economy or slow economy, people still pay to have work done on their vehicles. MAACO offers you an automotive business franchise opportunity that can help you realize both your financial and personal goals. you're in business FOR yourself, but not BY yourself. MAACO's automotive franchise can provide opportunity for those who possess drive, ambition and a strong work ethic. MAACO owners come from all walks of life and automotive experience is not needed. For those who can meet the minimum $75,000 cash investment, MAACO has been able to help with the rest of the financing 95% of the time for those who have been awarded a franchise enabling them to move forward with this great automotive service business opportunity. 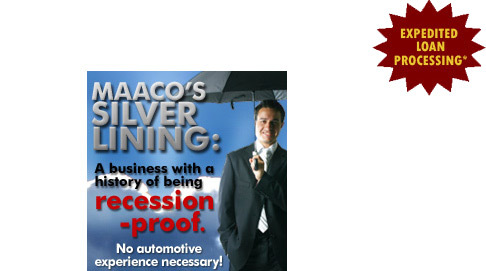 MAACO is recognized as one of the best franchise business opportunities available today. There are nearly 500 MAACO franchise Centers operating in the U.S. and Canada today with system-wide sales approaching 1/2 Billion dollars! $75,000 Minimum Cash Required: Financing assistance available for qualified applicants. Note: By submitting this form, you are under NO financial obligation of any kind. This is not an offer of a franchise. An offer may only be made after receipt of our Uniform Offering Circular. Click on Request Information for FREE info on how to open a Maaco Collision Repair & Auto Painting franchise today! Please Note: This Maaco Collision Repair & Auto Painting franchise opportunity and other franchise business opportunities, businesses and franchises for sale on this web site are not to be considered as an "offering", "franchise offering", suggestion or recommendation by Franchise Leader™. This advertisement depends entirely on the truthfulness of the information provided by our advertisers which includes, but is not limited to, franchisers, franchise brokers, franchise consultants and business brokers. Franchise Leader™ recommends that you consult a lawyer, financial consultant, accountant or professional advisor before buying a franchise or business opportunity or any type of business. By using this form or any part of our website, you have agreed to all terms and conditions of Franchise Leader™. Please review our Terms & Conditions for more information.